The Connecticut General Assembly convenes on January 9th in Hartford. 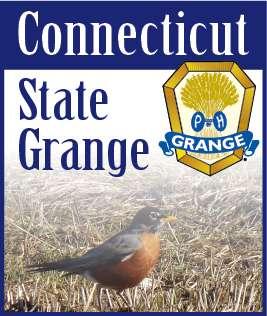 The Connecticut State Grange Legislative Committee will be monitoring bills and presenting testimony when warranted. Gordon Gibson will again be our voice in Hartford. His political connections are a valuable asset to the Connecticut State Grange. He will be talking to Senators and Representatives conveying our opinions on the different bills. By now bill requests to be brought up during the session have been presented to the legislature by Assembly members. These will be assigned to various legislative committees for review and action. Legislative Committees also can present committee bills as the session progresses. As the bills progress we would hope that Granges would lend their support or objection to the different bills. The State Grange testimonies at committee hearings are one of the tools with which we convey Grange opinions. The State Grange Legislative Policy Guide is another tool we use. This guide will be sent to all of the General Assembly members and Granges. But, having the individual Community and Pomona Granges add their voices to the different bills really can enforce Grange influence. This can be done by the Grange itself pending a communication on behalf of their members or by individual members. You do not have to feel that you need to go to Hartford to voice your opinion. Writing or contacting your local Senator and Representative can have just as much of an influence. For some bills we also recommend that you contact the committee chairman and/or members of the committee that is hearing the bill. When you contact them, please be sure that you clearly communicate which bill you are referring to and then state your opinion. Incorporate your reasons for your opinions as well. On the Federal level, we are still waiting on the Farm Bill. (I am assuming that the Federal Legislators did not act on this before the end of December). If this bill was not acted on by the end of December, milk and dairy product subsidies will have to come to an end. This sets a minimum wholesale price for milk. Several conservation programs will be frozen. The extension passed before the end of December, but we still need to have the farm bills finalized so farmers can determine their crops for the next growing season. Remember that the farm bill is the Farm and Food Nutrition Bill.l Only about 20 percent is for the farm side. The rest is for food nutritional programs such as the school lunch program and SNAP, which was previously known as Food Stamps. If you would like to be more involved with the activity in the General Assembly, email me at legislative@CTStateGrange.org and ask to be placed on our legislative action list. We will send out emails to concerned members when issues arise that need immediate action.